There really has not been a lot of books about the Canucks in the past 40 years. So when they say this particular book has been 40 years in the making, it is almost worth the wait. From the very first game back on October 9th, 1970 to the Henrik Sedin's Art Ross and Hart trophies in 2010, the beloved team's history is relived throug the stories of our favorite personalities. The history of the franchise is relived brilliantly, thanks to in large part to over 250 lavish photographs, many of which have never been published before. The photos that fill the glossy pages of this coffee table book capture any Canucks fan's attention upon the first cracking of the spine. The books is so much more than just a collection of photographs. The franchise's most treasured moments are brought back to life by veteran sports journalists Greg Douglas and Grant Kerr. Many others, including Jim Hughson, Iain MacIntyre, Don Taylor, Elliott Pap and Norm Jewison, make their own contributions. What I like best about this book is that it commemorates the franchise's history through the stories of the players. In a blue collar hockey town like Vancouver, the players - both the superstars and the characters (of which the Canucks have had many!) - are very much the heart and soul of our memories. They are without doubt the reason why we love the Canucks so much. The authors brilliantly tell the story of the Canucks - which has not always been a great one, by any means - in chronological order of the team's stars and fan favorites. Starting with the likes of Dale Tallon, Orland Kurtenbach and "Cracklin' Rosie" Paiement of the 1970s, through to the likes of Harold Snepsts, Stan Smyl, Tiger Williams and "King Richard" Brodeur of the 1980s, through to Kirk McLean, Pavel Bure and Trevor Linden of the 1990s to more recent years of excellence starring Markus Naslund, Roberto Luongo and Sedin Twins. Local legends like Babe Pratt, Larry Ashley and Jim Robson join fan favorites like Suitcase Smith, Ron Delorme and Gino Odjick also getting full features. The photos wow, but it is these players profiles that are best part of this text. They offer first hand accounts, with some interesting insider stories. Reading the back-stage stories about Trevor Linden's mindset on the day of his final game or of Harold Snepsts memories of 1982 or of Kirk McLean playing down his heroics in 1994 or getting inside Roberto Luongo's head in the hometown Olympics of 2010 are the real gems that make this book great. Conspicuous by their featured absence are Cliff Ronning, Tony Tanti, Mattias Ohlund and especially Brian Burke (he does get some space in the story of the drafting of the Sedins). I also would have liked to have seen more memoribilia featured, and maybe a side-bar countdown of the top games in team history. All in all Canucks at 40: Our Game, Our Stories, Our Passion is good book and certainly a must have for all Canucks fans. 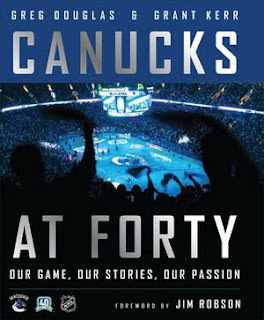 Canucks at 40: Our Game, Our Stories, Our Passion would be the obvious Christmas gift for any Canucks fan this year. Few hockey teams have fans as loyal as the Vancouver Canucks, an expansion team that made it's debut in 1970. With unprecedented access to the team's photo archives and commentary from players and coaches, this one-of-a-kind commemorative album, authorized by the Canucks and licensed by the NHL, gives fans an intimate look at Vancouver's favorite sons. Written by two veteran sports writers with contributions from hockey insiders, this book documents much of the team's rich history, including magic moments from the past, star players and coaches, and the club's biggest goals. Offering a candid and behind-the-scenes look at one of hockey's most popular franchises, Canucks at 40 is a treasured keepsake that devoted fans will love. I've almost finished reading all of it! Thank you for the smiles, memories and some tears! This book is a MUST for all true fans! I was reading the article above and never they mentioned Andre Boudrias (number 7) and he was the top scorer at one point. He had the record on assist for almost 30 years that was beaten by Sedin.. wonder if they mentioned him in the book.. have to buy it..